Simple maps that use familiar geographic boundariesZIP Codeshelp HCMC notify the public of aerial treatment for vector-borne disease. The mosquito control division of the public health department in a Texas county is using GIS and GPS as part of a comprehensive program for preventing and controlling mosquito-borne diseases. The Harris County Mosquito Control (HCMC) division operates as a series of systems that perform disease surveillance, test the effectiveness of abatement efforts, and conduct pesticide resistance testing. Harris County, Texas, is the third largest county in the United States. Its population of more than 3.5 million is spread over 1,700 square miles. HCMC serves the entire county including the city of Houston. As part of the county health department, HCMC has taken an active role in developing technology that better serves the public and helps prevent vector-borne diseases, particularly St. Louis encephalitis and West Nile virus. HCMC received one of the Mobile Government grants given jointly by Esri and Trimble. The grant made detailed field data collection possible and streamlined the data integration techniques of field staff and managers. The county received a Trimble GeoXT handheld field data collection unit with ArcPad. HCMC personnel have developed better field data collection techniques and are more effectively monitoring surveillance and control efforts. GIS and GPS have become integral to disease surveillance in Harris County. This equipment has significantly enhanced HCMC's ability to respond to disease outbreaks. Traditionally, spatial analysis of disease has been fundamental to public health departments. Activities such as public notification, archiving, analysis of treatment efforts, and research collaborations all have integrated geospatial data. HCMC's team of entomologists, field and laboratory staff, public health officials, and one geographer uses geospatial technology to gather, sort, display, and analyze data relating to mosquito-borne diseases. HCMC laboratory personnel act in concert with field personnel in collecting mosquitoes and birds for disease surveillance and conducting on-site testing and evaluations. ArcPad forms expedite entry of data, which was previously recorded on paper in the field and then manually entered into a database after returning to the main office. Now field technicians and supervisors can collect surveyed coordinates for a variety of data, display sites on a reference map, and immediately capture environmental conditions and note potential mosquito breeding habitat locations. ArcPad simplifies the process of recording accurate data. Some frequently used applications include the inspector's forms for monitoring collection sites for mosquito larvae and areas treated with larvicide. The Test and Evaluation (T&E) laboratory assesses commercially manufactured mosquito trap endurance and effectiveness for mosquito abatement and surveillance. In addition, the T&E laboratory conducts resistance testing of commercially available pesticide products to determine if the mosquito populations breeding in specific areas of Harris County are becoming resistant or less sensitive to pesticides. To test pesticide resistance, pole-mounted cages are erected in a 200-by-300-foot grid. Each pole holds two cages-one contains the test mosquitoes collected from field populations, and the other contains a susceptible strain of colony mosquitoes. 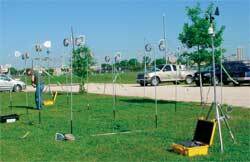 To test pesticide resistance, pole-mounted cages are erected in a 200-by-300-foot grid. Each pole holds two cages. Each cage contains a carefully counted number of Culex quinquefasciatus mosquitoes, the main vector species of St. Louis encephalitis and West Nile virus in this region. One cage contains the test mosquitoes collected from field populations, and the other contains a susceptible strain of colony mosquitoes. The next step in the resistance testing is the introduction of the pesticide. In this region, the ultra low volume (ULV) spray truck is the most commonly used application method. For the test, the spray truck is driven at five miles per hour past the grid in a path perpendicular to the prevailing winds, so that the plume of pesticide is carried through the grid of poles. After the drift has dissipated, the mosquitoes are collected from the cages. The collection of survivors is observed during the following days in the laboratory and mortality rates are noted for each site. This allows the T&E laboratory staff to ascertain the effectiveness of the tested pesticide; the results become invaluable for vector-borne disease prevention. The use of georeferenced data helps ensure the accuracy of the grid setup and drive path for the spray truck. The data recorded at each pole site is then used to analyze and display the sensitivity of the mosquitoes at each site to specific pesticides. Although this project was not included in the original mobile government grant proposal, it has proven to be one of the most beneficial uses of the grant. The advantages of field data collection have been used in the Inspection, Test and Evaluation, Mosquito Surveillance, and Avian Surveillance sections of HCMC. ArcPad Application Builder was used to create forms for specific purposes. While each section has unique functions and collection techniques, each section gathers point data. The field data collection forms for each section are simple. These forms can easily be completed in the field and seamlessly record the same data previously entered in the office. Data management has been improved by using data tables stored in Microsoft Access databases that were created by each section. These data tables store detailed data for each sample collected and each site visited. The ArcPad forms create a DBF file with the same fields used in the existing databases so these files can be downloaded and integrated with those databases. Building on the present database format, the ArcPad forms were easily deployed to field personnel already familiar with the data they had to collect. HCMC personnel have aggressively implemented an active and updated geographic information system. They strive to build better datasets and share valuable data with other agencies in a timely manner. As a public agency, HCMC has set the standard in vector and disease surveillance. As part of the Harris County Health Department and the greater Harris County area, HCMC actively promotes the use of GIS in all aspects of surveillance, analysis, and reduction of disease occurrence. For more information, visit the Harris County Health Department Web site or contact Christina Hailey.